(CNSNews.com) - The number of people working for the federal government has declined by 11,000 in 2017 while the number working for state governments has declined 2,000, according to data published today by the Bureau of Labor Statistics. But because the number of people employed by local governments has climbed 12,000 so far this year, the overall decline in the number of people employed nationwide by government has only dropped by 1,000 in 2017. Meanwhile, even though manufacturing jobs have increased by 137,000 this year, the number employed by government in August still exceeded the number employed in manufacturing by 9,818,000. In December 2016, there were 22,299,000 people employed by federal, state and local governments in the United States. By August, that had dropped to 22,298,000—a decline of 1,000. On the federal level, there were 2,819,000 people employed by government in December 2016. That dropped to 2,808,000 in August—a decline of 11,000 so far this year. On the state level, there were 5,085,000 employed by government in December 2016. That dropped to 5,083,000 in August—a decline of 2,000. On the local level, there were 14,395,000 employed by government in December. That climbed to 14,407,000 in August—an increase of 12,000. With federal and state governments dropping a combined 13,000 employees so far this year, and local governments adding 12,000, the net change in government employment nationwide so far in 2017 has been a decline of 1,000. The 22,298,000 people employed by government in the United States in August continues to far outstrip the 12,480,000 people employed in manufacturing—evening though manufacturing has seen employment gains this year as government employment has marginally declined. Of those 155,000 manufacturing jobs added since last November, 137,000 have been added since last December. In the last month of 2016, there were 12,343,000 people employed in manufacturing in the United States. In August, there were 12,480,000--accounting for the 137,000 gain in manufacturing jobs thus far this year. Even with the recent gains in manufacturing jobs and the small drop in government jobs, the 22,298,000 people employed by government in the United States in August still outnumbered the 12,480,000 employed in manufacturing jobs by 9,818,000. 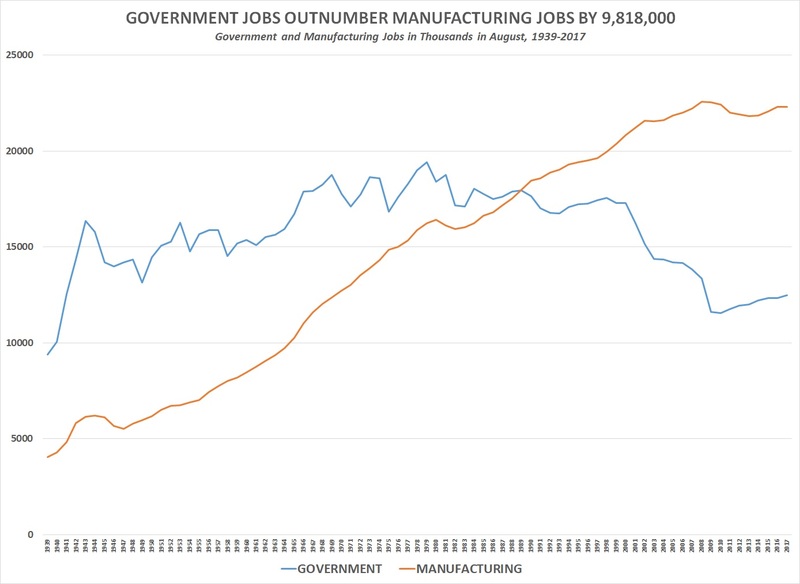 From 1939, when the BLS started tracking manufacturing and government jobs, through 1988, manufacturing jobs always outnumbered government jobs in the United States. In August 1989, for the first time, government jobs exceeded manufacturing jobs in this country.